Tonight, me and Alex took a walk down Bayswater to see Marble Arch. We continued down Oxford and turned right onto North Audley Street to see the U.S. Embassy. We walked around the green that is in front of the embassy and which also contained the Canadian, Bahrain and Italian embassies. 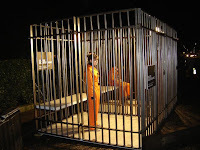 There was an interesting exhibit outside of the U.S. embassy. 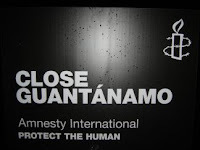 There were 2 people, on their own free will, locked in cages with the signage 'Close Guantanamo' out front. An obvious protest to the U.S.'s continued presence there, it was an seemingly powerful portrayal, assuming people stay in these cages 24 hours a day. You should build a cage right next to them saying "Close Frisch's Big Boy." An obvious stand against foodborne illness. I love reading about all of your adventures. It makes me feel closer to you during this time apart. I can't wait to travel together over there! I'm looking forward to reading more stories! I love you!